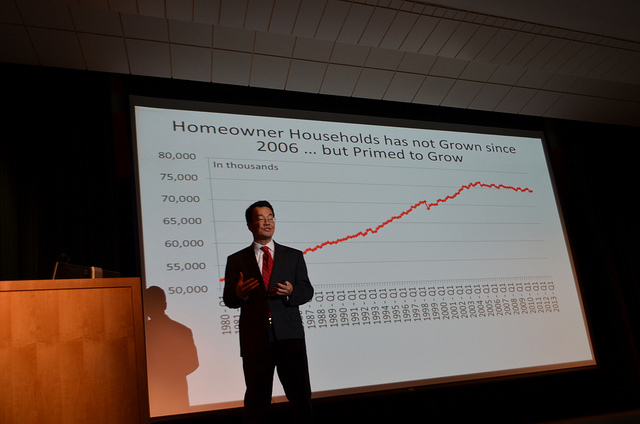 The Kansas City Regional Association of Realtors brought Lawrence Yun, NAR’s Chief Economist, in to shed some light on what the real estate industry can expect in 2014. Right now, inventory is bouncing at 13 year lows. This has contributed to our rising prices and a new crop of For Sale by Owners. Nationally prices have continued to rise in the double digits throughout 2013 and with the current inventory shortage, this should continue through 2014. We all have witnessed some areas of Kansas City tracking at a good rate, so please visit my previous blog posts or contact me to find out the exact numbers for your particular area. 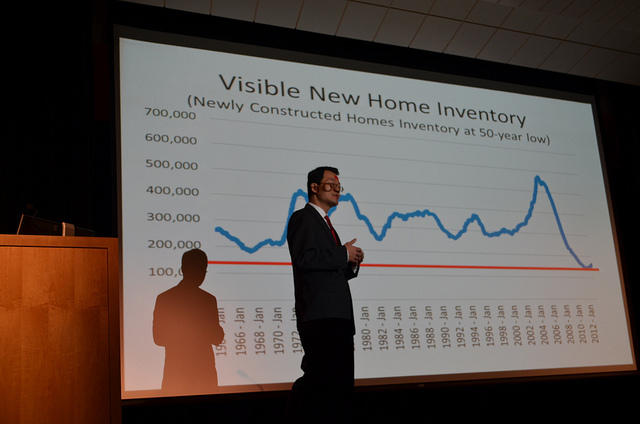 Dr. Yun stressed the importance of our need for more new construction, as new construction inventory is at a 50 year low. He said new home starts need to reach 1.5 million or we will have a persistent inventory shortage nationwide. Kansas City’s housing starts are at about half of their average. Another interesting stat showed us the gap between new and existing home prices is larger than it’s ever been. The only way this can be fixed is to have a dramatic increase in resale home prices. Right now, we are battling appraisals on about every other transaction. Consumers can rest assured real estate agents in Kansas City are fighting the battle against low appraisals with fervor. We are doing our best to keep those prices moving! One of the most surprising stats was the fact that 30% of the transactions are cash. Lawrence stated further studies have indicated many parents have purchased homes for their children with cash and they are actually becoming the ‘lender’, having the payments with interest paid to them instead of a bank. Others are paying cash for the house to make their offers more appealing than the others that would be bidding on the same property. After the home closes, they are taking out Home Equity loans to finance the property and have the tax benefits from doing so. Some good news? Missouri and Kansas’ shadow inventory of distressed property is not only lower than the U.S. average, but has also shown only gradual changes (with the exception of the 2010 spike) over the last 13 years. There are bubbles in other areas that will hit soon, New York is one of the highest, almost double that of the entire U.S.
Interest rates will remain low, taking into account they were at 8% or higher 13 years ago. 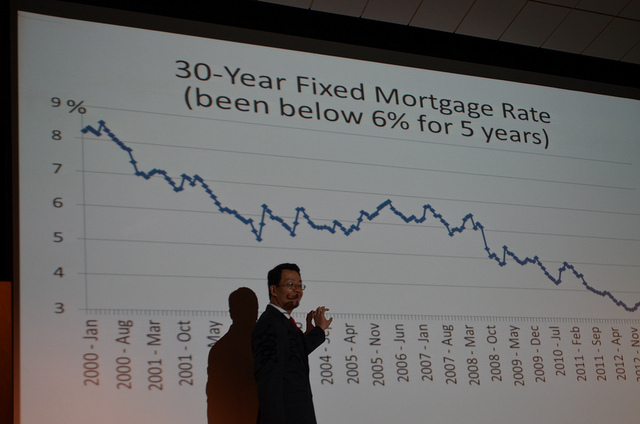 Dr. Yun stated they should increase to 5.3% by the end of 2014. He predicted steady sales throughout 2014 with no increase in the number of sales, but the increase in home prices should help offset the lack of growth. Another note, there has not been a meaningful increase in REALTOR membership which means less competition overall. I felt this was one of the better forecasts as it seems more realistic than it has in year’s past. Trust me, there’s been several years we’ve left this forecast wanting to jump off a bridge and last year was full of unknowns. Since we’re finally seeing some steadying in the market, the economists are leaving less to chance and making strong predictions. To me, this in itself is positive. 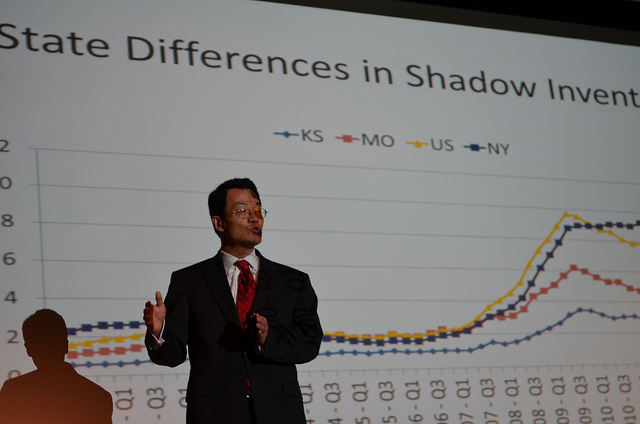 Special thanks to Dr. Lawrence Yun for making the trip to Kansas City. Click here for all the slides from the presentation. As discussed last month, Kansas City has become a very level housing market. In my opinion, the leverage in a transaction belongs only to the person that’s least motivated. For example, if a buyer has to have a home purchased within a certain time frame, the seller will have the advantage. The same thing can be said for a seller that has to unload a property. This is where agents need to recognize the hot buttons for their clients and also pay close attention to any hot buttons from the other party. Our negotiating skills will be put to the test along with our fabulous listening skills. Sales ARE still happening, but because sales have slowed down, we will see some discouraged sellers taking their homes off the market for the holidays. Buyers need to be aware of this and try not to hesitate when they find one they love. Clay/Ray County sales were down for the month by 4.1% from 2012. Units were at 256 versus 267 last year. Year to date, unit sales are up 6.7%, with 3,334 units this year versus 3,124 last year. The average sales price for the month was up 10.1% from last year, with an average price of $160,875. Year to date, the average price is up 9.4%. The average price is $159,340, versus $145,722 last year. New listings were up 89 units to 523 or 20.5% from last year’s 434 units. Inventory is down 0.9% from last year and is running at 2,015 units. Inventory is up 18 units from last month. Platte County sales were down for the month by 9.1% from 2012. Units were at 110 versus 121 last year. Year to date, unit sales are up 6.6%, with 1,441 units this year versus 1,352 last year. The average sales price for the month was down 10.7% from last year, with an average price of $193,321. Year to date, the average price is up 6.5% from last year. The average price is $204,275 versus $191,834 last year. New listings in Platte County were down 6 units to 207 or 2.8% from the 213 units last year. Inventory decreased 6.9% from last year and is running at 885 units. Inventory is up 25 units from last month. Adjusted Sales* for the entire Heartland area were at 2,311, up for the month by 5.3%, or 116 units. The average price was up 7.9%, and averaging $183,559. Year to date, sales were up 9.7% or 2,263 units for a total of 25,550 for 2013. The average price for the year is running at $182,483, up 9.4% from 2012’s average of $166,832. Do I Have to Select a Local REALTOR? Love me or hate me, we’re going to discuss this. Selecting a real estate agent should be based on their skills, experience, your comfort level and their ability to help you make an informed decision on buying/selling your home. Consumers run into trouble when they think they have to call the person on the sign or only know enough to go with the company’s office they pass on a regular basis. Now, if you decide just to use your brother-in-law’s uncle’s cousin because it’s the right thing to do—stop reading and best of luck with your transaction. Let’s first start with the reasons you wouldn’t use a local agent. Really, there are some. Your local selection of real estate agents could include people you don’t trust or companies that don’t align with your values. It could also include agents with limited marketing capabilities or experience. My advice in these situations would be to check out the closest surrounding cities and start your interviews. This is a big decision and consumers should be able to feel comfortable with their choice in a real estate agent. You have options. I reserve a special exception for those that have met a real estate agent they know, like and trust and wish to have them guide you, even though it’s outside their regular service area. A high level of trust needs to be one of your top priorities and can sometimes mean more to you than finding the local attractions. On the other hand, local real estate professionals can offer quite a bit to consumers. Their knowledge of their local area turns them into experts when it comes to value, desirability, convenience and other factors. For sellers, having your home priced properly in the beginning can mean the difference between having your house on the market for a year and selling in a week. Also, that sign in your yard is like a beacon, asking for drive-by buyers to call. When your listing agent answers their phone, would you like to have someone that can tell the buyer how far away the grocery store is located? How long it takes to get to different areas of the region? Who is better at conveying the benefits of living in the area than someone local? As a buyer, a local professional will know the most convenient routes to take in and out of neighborhoods. They will have great information on the schools and activities in the area. A local agent can also be very helpful when determining whether or not the home you love is priced properly—-you don’t want to overpay do you? Now, I’m not saying every real estate agent has to be local. There are some wonderful agents that aren’t local that will take the time to learn everything about an area in order to serve their clients. When someone is willing to work this hard for their client, it’s definitely a great partnership. Before making a decision this big, check the internet, look for testimonials and reviews and ask your friends and family about their past agents. There’s a ton of pricing theories in our real estate world. I would encourage you to have the discussion below before your home is listed on the internet or before your next price reduction. The simple truth is, getting your home sold quicker could be as simple as a couple of rounded numbers. This is a portion of my blog post featured on Better Homes & Gardens Real Estate Clean Slate blog. Today, a buyer could search from $200,000-$230,000 or from $230,000 to $250,000 (especially if it’s a pre-populated drop-down list). Notice any similarities in the above example? $230,000 appears twice. Online marketing isn’t new and it isn’t all about photos. As a listing agent, it’s important to regularly reinforce our value by doing everything we can to properly price a home for both offline and online marketing to ensure we get the most buyers’ eyes on the listing. In some instances, this could mean moving the price to a rounder number in order to double the views. About six months ago, we decided to add a rambunctious blue heeler to our family. Just like a crawling toddler, he gets into anything and everything that seems fun. One of his favorite things to do is play in the cat litter. Like any good mommy, I dealt with this habit with patience for a while because he’s ‘just a puppy’. However, there’s only so much nasty cat litter a person can handle cleaning. After a few temper tantrums, I decided I needed to find a final solution that didn’t involve giving away any of our beloved animals. I needed to literally think outside the box for this stubborn puppy. Could we build a shelf? Put the catbox in another room with a kitty door? Get a different box with an alarm? Okay. Really. All of that was too much trouble. And then…it came to me. I turned the catbox around. There’s now a narrow passageway for the cat to shimmy through and the entry to the box faces the wall. By increasing the level of difficulty for the puppy, we simply got him to ignore the box altogether. How many things are we dealing with on a regular basis that could be fixed by thinking outside the box? Take another look—-I bet there’s an easier solution than you think. 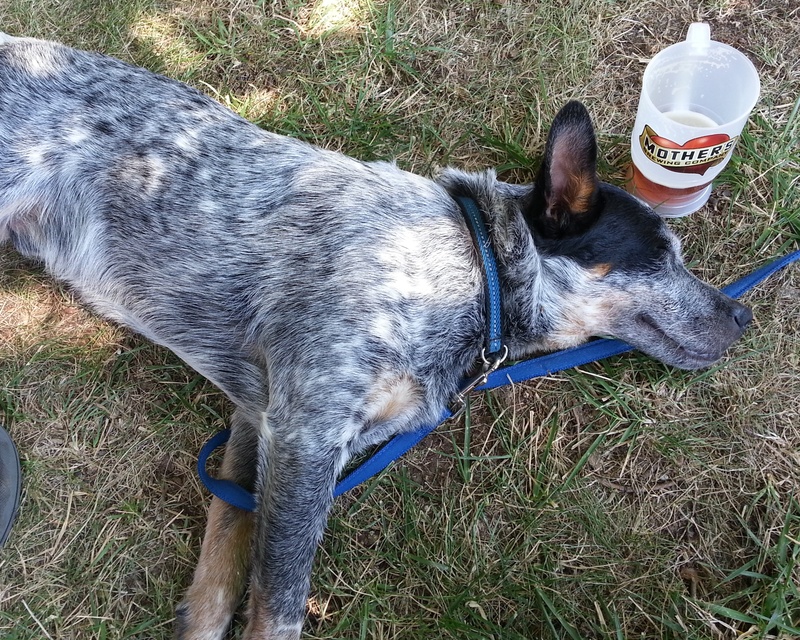 **Special thanks to Mother’s Brewery for letting our puppy take part in Oktoberfest in the Ozarks. He didn’t really drink the beer—calm down people. My friend, Wendy McDermott, is keeping everyone updated on the effect of the government shutdown on new loans and what it means for our real estate business. THE SHUT DOWN IS A MOVING AND DEVELOPING SITUATION. I AM TRYING TO KEEP EVERYONE UPDATED AS BEST AS I CAN. FEEL FREE TO SHARE. FHA will be able to endorse single family loans during the shutdown, however, only a limited number of FHA staff will be available to underwrite and approve new loans so the process may take longer. SINCE MOST LENDERS have delegated authority, minimum impact – IT IS NOT COMMON FOR LOANS TO BE UNDERWRITTEN BY FHA. THIS WOULD ONLY EFFECT VERY SMALL MORTGAGE BANKERS. Since many of the functions we use are electronic (ordering of case numbers, payment of MIP and/or Funding Fees, self-insuring of loans etc. ), there is no change in this regard. Anything that does require human intervention (loans sent to USDA for prior approval, assistance with VA on Certificate of Eligibility problems, loans that must be manually insured, etc.) will be delayed. However, we believe this is a very small portion of our business. • We have been advised that there will be delay in IRS transcripts. Although they are ordered electronically, we have received notices from our vendors that those will have a delay. We have not yet received guidance on how to handle BORROWERS who are also government employees. I expect guidance on this topic later on today. Thanks, Wendy for this update!